The Thanksgiving holiday was this past week, and for me it means multiple dinners with in-laws, my family, friends, and cooking. Lots and lots of cooking. This year, for health reasons, I had to experiment with vegan cooking. (Part of the joys of living with an auto-iummune disorder that affects your digestive system.) I still had a taste of the turkey (delicious, and a terrible idea), and even a tiny slice of cheesecake (tastiest bad idea ever), but I did manage to make some actual tasty vegan food. Most of it was cobbling together ingredients and substitutions based on recipes I’d already tried that were non-vegan. 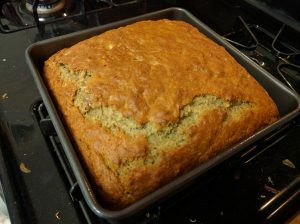 So I ended up with a tasty pumpkin pie (needs work to get it to solidify better), veggie stuffing, a vegan pot-pie (needs work so it won’t look like puke in a crust), vegan banana bread (A+ perfect would try again, even though I accidentally put too much baking soda in the mix), and a not-vegan cornbread casserole (too tired for egg replacer, so I just used egg). 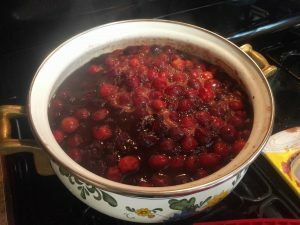 I also made my usual cranberry sauce, which is amazing. I mean, just look at all this delicious food! 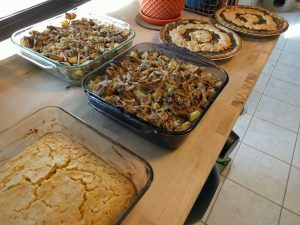 So let’s talk about Thanksgiving and what it means. I come from a mixed family – dad is from Egypt, mom is from Mississippi – and I have friends from all over the country and the world. To me, Thanksgiving wasn’t about celebrating the Pilgrims landing at Plymouth Rock and making nice with the Indians (apparently they taught the Indians how to be civilized humans or something? Oh wait….) or a Civil War-era plea for thankfulness. For me Thanksgiving was actually a holiday about being thankful for what you have and celebrating being together as a family. Also roast waterfowl (because dad always liked duck more than turkey). The American myth about Thanksgiving is particularly ironic this year, given the spectacle of Indian Tribes protesting the Dakota Access Pipeline right now. American / Indian relationships in this country have historically been troubled at best, violent at worst. It’s easy to forget things like the Trail of Tears and Wounded Knee as some remote event in history that doesn’t even matter anymore. I have my own personal connection to the legacy of Native American struggles – my great-grandmother was Cherokee, from the Shreveport, LA area, and the only things I remember about her were her long, dark, steel-grey hair that was always braided, and her mumblings from deep in her dementia, “I ain’t no Injun.” But I am also disconnected because I was raised in a household with a white mother and an Egyptian father, so my take on Thanksgiving is partly as that of a child of immigrants, and partly as a child of a Southern white family. 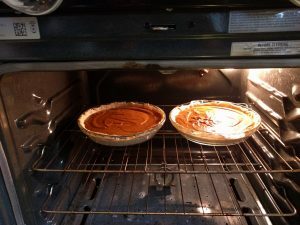 I had the privilege of approaching Thanksgiving detached from the legacy of Native America, even as I had my own direct connections to it. It makes for a more thoughtful time for me, as I consider my own place in this country. Even the “traditional” Thanksgiving meals we had at my house weren’t all that traditional – roast duck, Basmati rice cooked with the fried vermicelli, Moulokhya, pita or French bread, and salad. For my family, Thanksgiving was more like a fancy dinner, than a traditional turkey spread. As an adult, the thankfulness of the holiday carries with it an undercurrent of pensiveness, and I wonder if I’m the only one who sees it this way. I have friends who play along with the American mythic pageantry of Thanksgiving, and I have friends who reject is outright as “Take The Land Without Asking Day.” I’m probably somewhere in the middle – the holiday is a time for me to reflect on what I’m thankful for and how I can turn that into helping others, but also to reflect on what the history of the holiday means in the greater scheme of our American society. This year, I took that reflection a step further and donated to the Native American Rights Fund, and also to the Standing Rock Sioux Tribe, as part of my holiday donations. I’m still conflicted about the DAPL – on the one hand, our pipeline infrastructure, much like the rest of our infrastructure, is badly in need of replacement and modernization. On the other hand, this situation looks like another instance of companies trying to bulldoze their way through the communities of people they don’t care about, who they see as being lesser than their corporate interests. I work as an O&G auditor for a living, so DAPL would benefit my industry as a whole, but the appearance of the situation is so bad that I just don’t see how I can support it as-is. So there it is. During a season where most of my friends are still reeling from a depressing election result, I came up with more things to be depressed about. You’re welcome, everyone.